It works. Most of the time. Minimalist one / max two-color designs are incredibly versatile pieces of artwork, that allow numerous different applications. Nothing is off the table: printing, video, web, embroidery. If you opt for the single-color option and go with black, then you free yourself from all boundaries; the form of your logo becomes its strength and the entire gamut of colors is at your disposal. My favorite example of this is Nike. The infamous “Swoosh” has been a part of the brand since 1971, when it was commissioned to the 23-year-old graphic designer Carolyn Davidson. 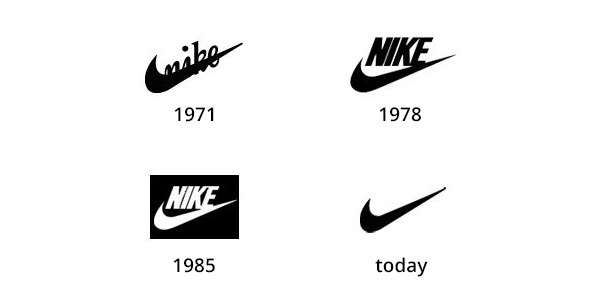 The logotype “Nike” has been a part of the brand for decades but, as the company became increasingly dominant, in the 90s, they decided to drop it and just keep the Swoosh; everyone knew perfectly well that the Swoosh meant Nike. A simple look at the wall of any given sports store, will show you how many different colors that Swoosh has adopted; and many more are still to come. But, as I mentioned earlier, in a single-color black brand, the form of your brand is its strength. So, the form must be… well… strong. The presentation featured images as the one above, to demo its versatility, compared to the company’s previous blueish, gradient-filled logo. No arguments there, the choice of a single-color design was definitely a good one. The symbol’s form, however, is a completely different story. The new symbol is supposed to be an evolution of the previous one. 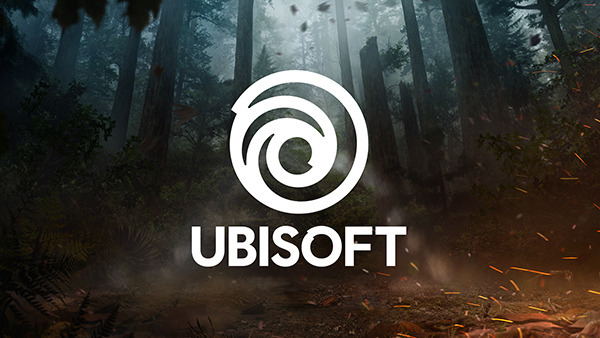 Since 2003, Ubisoft’s brand has featured the symbol of a swirl, possibly a maelstrom, considering the blue hues, or a storm, considering what looks like a literal eye at the center of it. I never really got to like this iteration. I abhor the gradients and I never could understand the choice of the symbol; a blueish swirl is very likely to bring a drain or a flushing toilet to mind. Don’t get me wrong, flushing is important; just not when you’re a games company. Moving away from the symbol’s connotations, the form itself is problematic. The symbol’s new iteration drops the perfectly circular form; the edge of one of the swirl’s lines slips out of the circle’s perimeter and another one does the same near the center of the symbol. The letter “O” of the logotype also has a similar “breaking the circle” aspect. Now, breaking a circle, while working with a swirl form is quite a daunting task; the balance can be easily lost. And it has been lost. The new symbol lacks balance and does not counteract that with dynamism. It just looks flawed, imperfect, even incomplete. It is not unlikely that, had they been bolder, choosing to bring that edge even farther out of the perimeter, the result would have been far more dynamic and pleasing. Perhaps they didn’t want to stray too far away from the previous iteration, or maybe they thought that it would have looked more like a snail shell and less like a maelstrom/storm. The radical choice would have been to completely drop the swirl symbol; nobody would have missed it anyway. I am personally astounded by the fact that a company called “Ubisoft” has never played with the assonance between “ubi” and “you be“. I would have built an entire campaign out of it.